I love discovering unique items for the home, and as an animal lover, it's especially fun to find handcrafted items that are both functional and beautiful with a little bit of animal whimsy thrown in! So I'm especially excited to share this new find with you today. Catherine's Table is an online shop that brings you unique tablewear and tabletop accessories crafted by American artisans. Founder Maureen Goldman says that Catherine's Table is about soulful dining, and having the work of artists at your table gives it soul. There's a story in each piece, and you'll find many of those stories at Catherine's Table. Check out some of the fabulous pieces and then read down to enter for a chance to win this adorable Dog and Cat Mug from artist Tania Julian. 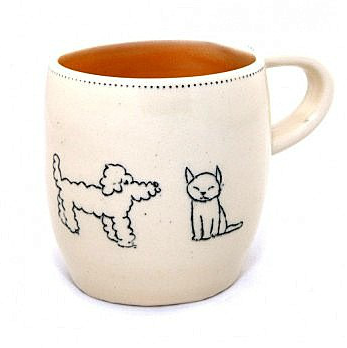 The mug features a big, smiling poodle who wants to be friends with an uninterested cat. Tania used a pumpkin glaze on the inside of the mug for contrast and stamped a wave pattern on the bottom, which is a signature element in all her mugs. To make purchasing from Catherine's Table even sweeter, for every purchase they will make a contribution to the Meals on Wheels Association of America that delivers 1,000,000 meals to home bound seniors every day. Enter via Giveaway Tools below. We have lots of ways you can enter. Feel free to enter as many as you wish. Catherine's Table is providing the prize for giveaway. My favorite is the mug! I collect them. They are way cool and fun. Have a terrific Tuesday. Slate Board is neat but I really LOVE the cat & Dog cups & bowls so cute! What a cute set! I love how simple looking it is so everything could be paired with other patterns. That Dylan mug is cool! Great gift idea for someone who has everything! ha! Love the fact there is a CAT and a DOG on the mug. Nice I don't have to choose between cats and dogs. I like the mugs especially the sunflower one. Cute stuff! Perfect that is is microwave and dishwasher friendly! There's a Frisbee mug that's really cute, but I really like the one being given away too! I like the Frisbee mug too! I think the whole set is nice. Their poppy plates are gorgeous. I really love the dishes and this mug! I love mugs, and carefully select one from my cupboard daily based on mood. This cup's a winner! I like the Fern linen napkins, and also the pasta bowls in all designs. 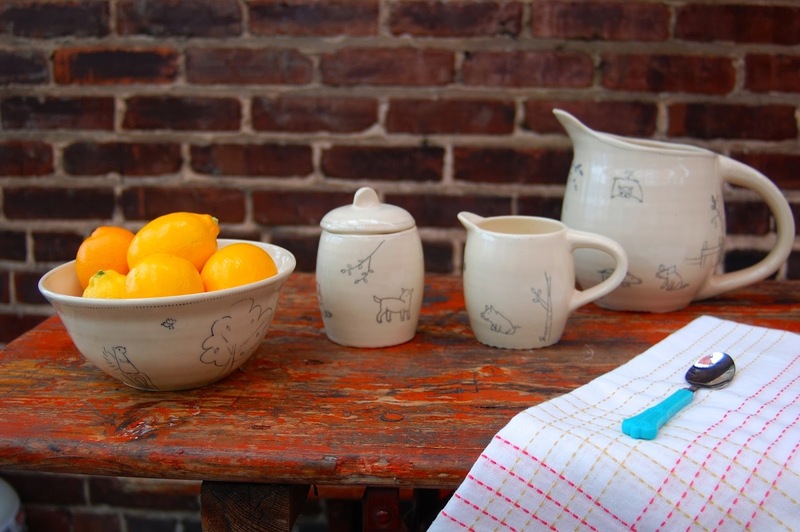 The good dog milk bottle vase is really cute, but so is the owl mug, and so many other items! I really like the cat riends milk bottle vase. I also like the Poppy Pasta Bowl. I love the Farm Scene Cereal Bowl! Thanks for the giveaway! Love your new look Diane and Rocco! Our favorite item is the mug! They are all great! But I love the different bird mugs, especially the birds on a wire mug! I love the Frisbee Mug. The dog and cat mug of course! My favorite is the Janis Joplin Tumbler. My favourite item at Catherine's table are the Recycled Ocean Tumblers. I love the owl mug. It is traditionally an item relating to animals when asked what item I like best, and I don't think this would be an exception therefore I am thankful for this wonderful opportunity to win such a set! A gorgeous set like this would be used every time my family arrives to visit! This also has a lot of meaning as I inspire others to adopt & have their pets spayed / neutered! I often even lay out that of what I can for those animals that are outside pets so they don't go hungry. The Sunflower serving bowl is so pretty but there is so much to like including the leaf platter and bird napkin rings. Very nice shop. I like the sunflower mug! I like the Midnight Blue Dog Bowl. What an amazing artist/shop. It's impossible to pick one, but I love the Koi Vase! 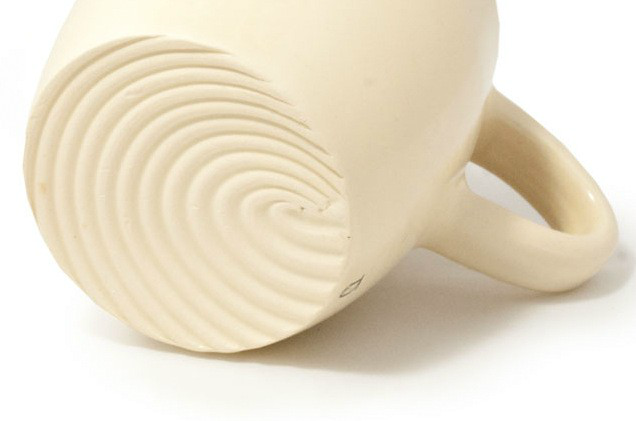 We love the beautiful pitcher! I like the little bird pitcher. I like the Slate Board. Bikes and birds soup bowl is cute. Love the Mugs and the American Modern Pitcher, my list would go on and on. Thanks for sharing this website with us. I like the frisbee mug and the milk bottle vases. My favorite item is the mug. The Love Vase is my favorite. The dog mug is awesome!! !